So, this will be my first post after being away for a while, and I decided to do it on someone I’ve admired for a very long time. As you’ve seen from my very first Music of the Week post, I enjoy Sungha Jung’s music very very much. Become an almost overnight web sensation, Sungha Jung first started posting his videos on Youtube in 2007, ranging from covers to his own compositions. The covers follow the notes perfectly, but adds his own sense of style to it, making it sometimes more enjoyable than the original. Lakewood began to sponser Sungha’s guitar officially on January 1st, 2009. He also recently took a tour of Finland, and had a performance in Korea’s 2010 Jazz Festival, which you can see on his channel. Or, if you’re too lazy, here. That was an intro. To see his main, really, go to his channel. So, in total, you can see my opinion: The boy is a prodigy whose music people from all over the world enjoy. Which makes me proud, seeing that he’s Korean. [Q] What made you play guitar? I think that many people want to know most. [A] That’s what I’m asked frequently. (Smiling) Three years before, the third grade and the second semester, it was the beginning that I urged my dad to teach me to play guitar that he was playing frequently. At that time, his playing looks great without any reason. Due to the such an appearance, I seemed to decide to learn the guitar. [Q] OK. Is your dad the professional musician? [A] No. He is also amateur player as just a hobby. [Q] In such a young age, playing guitar with bigger than you looked difficult, I think. What was the most difficult thing when you learned the guitar at the first time? [A] Frankly, nothing was easy. I could not pose properly due to the big guitar and even pressing the strings was also painful and hard due to small hands. 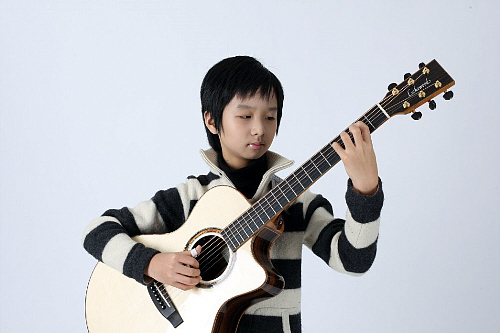 [Q] 9-year-old is an age easy to give up, but why did you continue to learn the guitar even though it was so hard? [A] Even if my hands were painful, the guitar sound was really wonderful to me. As my fingers went, there were the different sounds. It was so interesting and pleasant. As the number of tunes I could play increased after hard practice, I could feel a big achievement. After mastering one tune, there was another tune that I wanted to play again and again. It made me not release the guitar. I still have so many tunes that I want to play. [Q] So then, what is the attraction of the guitar do you think? [A] Mmmm, Joy can be a joy and sadness can be a sadness… With guitar, I can express as much as what I feel. That’s the attraction of the guitar. [Q] I heard that you were self-taught. [A] At first, my dad taught basic things such as the feature and how to play. Later, I could practice as I heard. I practiced with a tab if there is, or did with my own drawing tab after hearing and remembering the beat and the melody. [Q] Is there a special reason that you adhere to a fingerstyle with your small hands? [A] Classic is so bored and accompaniment is not fun. BTW, a fingerstyle is so sensuous, funny and pleasant to play. I think that the reason why I could not lose the interest in the guitar is the technical fun from the fingerstyle. Since it can fine-tune the feeling of the song, it’s the ideal style that I want to play. [Q] How many hours a day do you practice? [A] About 1~3 hours a day. [Q] You are still a student. When do you usually practice? [A] Since the school life is more important anyway, I am practicing after homework and other study including English. When I’m so busy, there is the day that I cannot practice. [Q] Due to young age, the continuous practice will not easy. How do you overcome when you are not willing to practice? [A] Mmmm, there was no time that I was not willing to practice so far. Sometimes, I feel distressed because my skill doesn’t get better. But, usually I am anxious to practice another new song. If there is so much homework and I feel tired after long English study, I don’t play guitar. No one forces me to practice. I don’t grip my guitar against my will. [Q] What do you do when you don’t practice the guitar? [A] I’m the same as the friends in my age. To play with friends is most funny. But, study in school, English study and guitar practice… I don’t have much time to play. [Q] Do you like the idol stars or listen to the popular music like friends in your age? [A] (Some break) I have heard some songs that my friends sing, but I don’t really know Korean pop songs. Since I used to listen to the foreign songs for guitar, I don’t have many chance for Korean pop songs and singers. Maybe I can know them naturally as time goes. Known as ‘BlueSea,’ he officially began blogging two years ago. You Tube, a U.S. video sharing site, helped in spreading his fame. Posting his performances and providing related information is, of course, the responsibility of his parents, but the blog is a space where he can build musical interest and communicate with his fans which began with just one or two. [Q] The title of your blog is ‘Blue Sea.’ What does ‘Blue Sea’ mean? [Q] Do you maintain your own blog? There are many resources that seem a bit too professional for an elementary student. [Q] I see. You’ve been well-known amongst netizens thanks to your blog, but you’re become very popular after appearing on the TV program, ‘Star King,’ right? [Q] At that time, your appearance was a big issue as ‘guitar prodigy’ and ‘August rush in Korea’. I want to know your feeling when you hear this kind of words. [A] Frankly, it’s not bad to hear. But, I want to win the recognition as a guitarist rather than those kind of words. Of course, I don’t have enough ability yet, but I want to stand on the stage, in front of the audiences, as a real guitarist after practicing more. [Q] Those kind of reputation may be a mental burden to you in such a young age. [A] ‘Prodigy’ is not what I like so much. If the word ‘prodigy’ is added to the front of my name, it seems that people hope something special to me. Frankly, it becomes a burden little bit to me. [Q] When I saw the show on TV, I could know that you’re a shy boy. [A] Yes. After the show ‘Star King’, there were said to be many request for the broadcast. But I would not appear on TV if at all possible because I cannot speak well and am too shy. I want to show only my playing. You are asking video greetings, but I couldn’t with shame. Please understand me. [Q] Sure. If seeing the uploaded video on your blog or YouTube so far, you seem to prefer a lyrical melody to a bright one. [A] Right. I prefer lyrical tunes. Of course, I also like bright tunes and have played many bright ones. But, most tunes that I want to try to play after listening are that kind of atmosphere. [Q] I heard that a company who sponsored the guitar appeared after listening to your play. [A] There is called ‘Selma Guitar’ who is sponsoring me from about two years ago. The manufacturer of Selma guitar saw my video and contacted me with the opinion – ‘It’s too bad to use the unfitted guitar for the adult’ and he wanted to make a fitted guitar. My current guitar is made by ‘Selma guitar’ and it’s much easier to play since it fits me well and its sound is so good. [Q] Is there any other instrument which you are interested in except guitar? [A] Drum! Recently, I’m thinking that I want to learn drum and there is no special reason. It looks exciting! For some reason, I feel that I can blow away the stress when playing drum. [Q] As I know, you are learning composition recently. Do you take a lesson? [A] No. I haven’t learnt composition systematically. My level is just to make tunes when the melody hits me. It’s the field that I really want to learn. [Q] Please introduce me one of your compositions that you like most. [A] I personally like ‘Night Flight’ which I composed recently I uploaded the video that I played this tune to my blog and got positive reactions. [Q] I also saw the video and I got unique feeling since it may be your own composition. What are this tune inspired by? A boy jumps over Korea. This is the comment by Mrs. Yoko Ono Lennon who is the avant-garde artist and the widow of the late John Lennon. Thomas Leeb who is one of the world famous guitarists already saw the video that Sungha played his song and showed his interest by contacting him by e-mail and Martin Taylor who is the only jazz guitarist that was appointed a MBE (Member of British Empire) also sent a message “Wonderful guitarist” to him. Now, he is dreaming to become the world famous guitarist over Korea. [Q] Recently Mrs. Yoko Ono who is the widow of the late John Lennon left a message on your video and it became a hot issue. I wonder how you felt then. [A] Frankly, I didn’t know that comment. When one of fans found it and let me know, I didn’t know frankly who Mrs. Yoko Ono is. But after knowing that she was a wife of the member of the Beatles, I felt really great. I am also surprised that she is 75 years old and that she is doing Internet. [Q] It’s a wonder that the only 12 years old boy knows the Beatles. Who is your favorite musician or role model if you have? [A] There are so many musicians. Thomas Leeb in Austria, Ulli Boegershausen in Germany, Kotaro Oshio in Japan and Byung-Woo Lee in Korea. I want to look after them. [Q] Thomas Leeb is with you in the profile picture of your blog. You seem closely related with him. [A] He is the unforgettable musician to me. He is the world famous guitarist and his technique of body-tapping and percussion is world’s top level. By the way, he saw my video on YouTube and contacted me by e-mail. I was unbelievably surprised and felt great. When he visited Korea in 2006, I met him and was really impressed. When I was rehearsing, he saw my play right beside me and corrected me if I was wrong. It was so precious time for me and I felt so sorry that I could not introduce myself due to my poor English. When I become a good guitarist, I really want to have the joint concert with him. [Q] Ah, I saw the picture of the present from Ulli Boegershausen in your blog. [A] He is the man like a mentor to me. I believe that I will have much more time to be with him if I continue the guitar. He promised to be beside me forever. I made a foreign website since he recommended positively. He sent the post cards, the letter and two music books with his own autograph last year and I was really pleased and happy. [Q] When I come to think of it, there are many musicians who contacted you through YouTube. [A] In addition to them, Laurence Juber, Martin Taylor, Walter Lupi and other great players who are much older than me also gave me an e-mail. Whenever it happened, I’m so glad and wondered. [Q] For what reason do you look after Kotaro Oshio and Byung-Woo Lee? [A] Kotaro Oshio is the right guitarist who made me addict to fingerstyle music. His ‘Twilight’ is the song that I played for the first time. He is the influencing and favorite musician that much. During early concerts, I have played almost all Kotaro songs. Since Byung-Woo Lee is the only fingerstyle guitarist, I like and want to look after him without a special reason. I have played his song “Bird” and it was not easy. But, I really like his own lyrical feeling. [Q] Were you on the stage with Trace Bundy recently? [A] Yes, many people showed the interest and it was also the impressive concert to me. He is really kind and modest man when I met him. I liked his dynamic playing style. After the concert, he promised me to keep in contact and to help me when necessary. [Q] ‘Canon’ played that day attracted many people. [A] Right. It was also really funny and impressive play to me. Actually, ‘Canon’ was not expected. But he felt nice when we played it a couple of time during rehearsal. Even though I could not practice enough, we played in good harmony even on the stage. [Q] Is there a musician whom you want to play with even though there is no chance yet? [A] Mmm. Andy McKee and Don Ross. In my opinion, the style of these two is much groovier than other guitarists. They are really rhythmical. If I am on the stage with them, I will be really excited and funny. I like that kind of play. [Q] As we talked more and more, I want to hear and see your play with my own ears and eyes. Do you have a concert plan in Seoul? [A] In November, there will be a concert in front of big bookstore in Seoul subway station ‘Jonggak’. I want to see many people then. [Q] You said that you want to be acknowledged as a guitarist not as a prodigy. What kind of guitarist do you want to be? [A] I am most happy to hear that one got relaxed or thought the forgotten dream though my play. I want to be the guitarist to bring those kinds of joy, happiness and comfort to the people though my play. Even though I’m still young, please wait for and expect me to become such a guitaritst. This interview was when he was nine, about four years ago. You can check out the original here. I previously put up a MFTS (Music For The Soul) featuring the same artist, Sung Ha Jung. I find his skill and way of playing songs so that it hits every single note yet adds his own taste practically irresistable. I’ll be doing an Artist Profile on him soon. So for now, listen to my favorite guitarist play my favorite instrumental song. It was featured in Hayao Miyazaki’s film Howl’s Moving Castle, and by far remains on my Top 10 list. You can listen to the original here.